"Whoever said ‘it’s all about the journey’? Nonsense! It’s all about the arrival, and it better be crease-free, crisp and fresh (we’re talking suits, by the way). 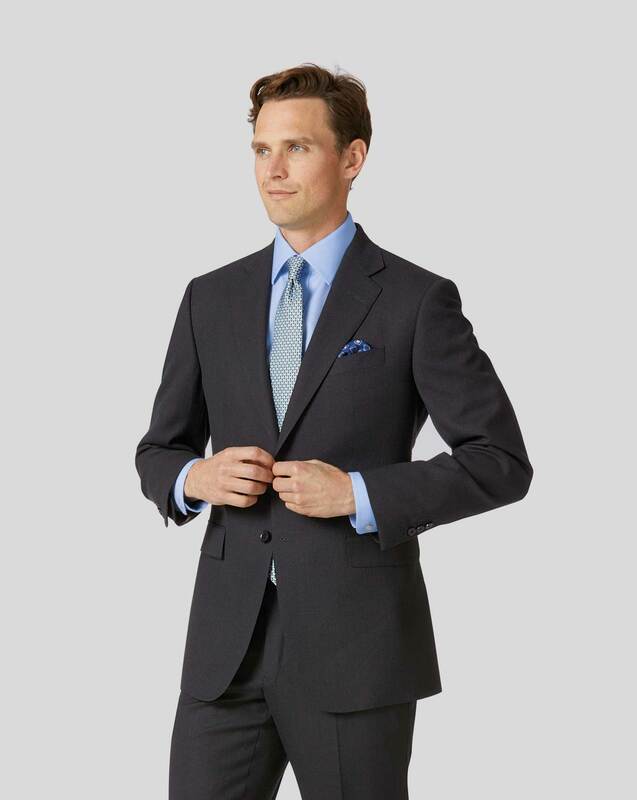 This formidable Travel suit is tailored from 120s Pure Merino Wool a 'birdseye' weave that adds depth and texture - with a half-canvas construction: perfect drape, impeccable shape and crease recovery for day-long sharpness." "Birdseye-effect 120s pure merino wool fabric with crease recovery, tailored with a half canvas construction for impeccable fit and drape." Want this as part of a suit? The higher the thread count, the better the cloth. Super 120s indicates fabric that's fine and woven purely from wool. The Charles Tyrwhitt Classic fit is cut generously across the shoulders and chest to provide maximum comfort and give you plenty of room to move. Extra long tails will ensure your shirt stays tucked in all day, while pleats at the back help the garment align with the shape of your body. Choose the Classic fit if you have a broad build, like a generous comfortable fit, or prefer a traditional cut with long tails. I have not received the order yet. Response from Charles Tyrwhitt: I am sorry to hear that you are yet to receive your order, I can see that you have recently contacted our Customer Services regarding import duties, is it possible that the order is still being held for payment? Tracking shows that your parcel arrived at the ACT facility on the 19th, and I believe you will contacted by the courier or customs to proceed. Please do let us know if we can be of any further assistance with any delays. I have a CT suit jacket in a smaller size which fits, and one in the same size which fits, yet this one is too small. Response from Charles Tyrwhitt: It's ever such a shame this beautiful suit jacket hasn't fit you perfectly, but thank you for sharing your feedback with us. There are subtle variations in fit between the luxury, travel and classic suit jackets based on the cut - but these are usually minimal and mostly cosmetic. I'm sorry this one didn't fit as a result, but please do return it to us so we can provide a refund or exchange for a larger size.